The Swift Parrot is a threatened species, largely due to the loss of its habitat. In 1988, the breeding population was estimated at 5,000 birds, in 2010 mainland surveys recorded only 2,200 birds. A recent population analysis model predicted that the population will decline by an average of 87% over the next 15 years without increased conservation efforts. Swift parrots are listed as critically endangered on the Australian Environment Protection and Biodiversity Conservation Act 1999. An extremely rapid decline in numbers is predicted owing to nest predation by the introduced Sugar Glider in its Tasmanian breeding range. In Tasmania, breeding habitat is being significantly reduced and fragmented through clearance of Tasmanian blue gums for agriculture, residential development and clear-felling for woodchips. Similarly on the mainland, clearance and degradation of habitat for agriculture, forestry and residential and commercial development is a major threat. Other threats include Psittacine beak and feather disease and illegal bird capture and trade. 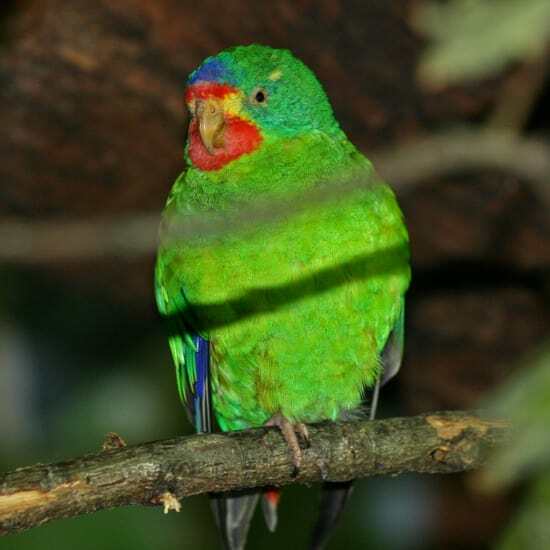 Swift Parrots breed only in Tasmania and then fly across Bass Strait to forage on the flowering eucalypts in open box–ironbark forests of the Australian mainland. While on the mainland, they are nomadic, spending weeks or months at some sites and only a few hours at others, determined by the supply of nectar. During dry years, when the eucalypts’ flowering is poor, Swift Parrots are forced to travel far and wide to find sufficient food, and may congregate into large flocks at sites where it is available. Earthwatch Australia is harnessing the power of citizen science through its ClimateWatch program collecting valuable data on the swift parrot. Citizen scientists are making observations on locations and behaviours of swift parrots across it’s known range. This data can then be used by government, academics and the general public to better inform decisions around the ongoing conservation of the species. Efforts are underway to reverse the decline in numbers of the swift parrot. These efforts include regular population surveys in Tasmania and on the mainland, utilising a large network of volunteers. In Victoria, areas of critical habitat have been added to the conservation reserve system. Other activities include the development of community awareness programmes and revegetation and habitat rehabilitation. Further efforts engaging the public in research, monitoring, management and advocacy need to be scaled up to ensure the swift parrot’s ongoing survival. Donate directly to EarthWatch Institute.